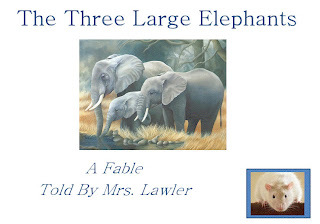 We started off by reading four of Aesop's Fables, "The Birds, the Beasts, and the Bat," "The Sick Stag," "The Maid and Her Milk Pail," and "The Rose and the Clay". We filled out this "Focus on Genre" sheet on Fables. I found it from Laura Candler's website and can be accessed for free here. We're going to be filling out these "Focus on Genre" sheets for each genre we study. This is the first page in our "genre" tab. We read three moral fables (by Leo Tolstoy) as well as a chapter from the book Pinocchio and continued to point out the recurring elements and characteristics of fables. I gave a Fables quiz, which can be downloaded for free. Then we read a fable that I wrote, "The Three Large Elephants," a spin-off of The Three Little Pigs. Then they composed their first drafts based on the information from the Story Map. They revised it using a color-coded key to make sure they had every necessary element. Then they proof-read for spelling, punctuation, and grammar errors. They switched with a partner and edited a classmate's paper. Then, to add some color, pizazz, and to excite the artistic students in my class while developing visualizing skills in all readers, the students created "Comic Strips" based on the beginning, middle, and end of their fables. Now, to wrap-up our unit, we're performing Fable Readers Theaters! I have two classes, so each one has been practicing their play and will perform it for the other next week. The students have worked diligently to practice their lines, learn their blocking, design the set posters, and create the props. 1. The Legend of Lightning Larry: A cowboy with a huge smile, a gun that shoots bolts of light, and a hankering for lemonade takes on Evil-Eye McNeevil’s outlaw gang. 2. More than a Match: When the king’s most powerful warriors are defeated by a giant who’s blocking the road, the Wise One must find a way past.